THESE ARE GORGEOUS! Easy to assemble. We bought 6 to set at our kitchen island. Searched all the major sites for the right set. Paid a tad bit more for these, but am very glad we did. Love these better than any of the others we saw. Quality and design are excellent. Safavieh 29.5" Taylor Bar Stool - Light Grey / Espresso (Set of 2) - 20" x 26.5" x 44.5"
A refined blend of gentle curves and elegant details, this modern wingback bar stool transforms any meal into a fine dining experience. Crafted with tufted white PU leather and a polished chrome nailhead detail, it brings sophisticated style to any dining area. Dimensions 25.0 In. X 22.5 In. X 45.0 In. 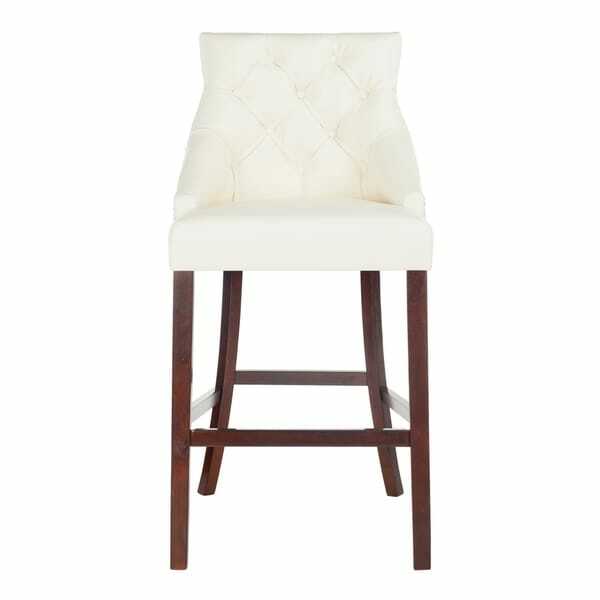 Safavieh 30" Eleni Tufted Wing Back Bar Stool - Navy / Espresso (Set of 2) - 22.5" x 25" x 45"